We did it! 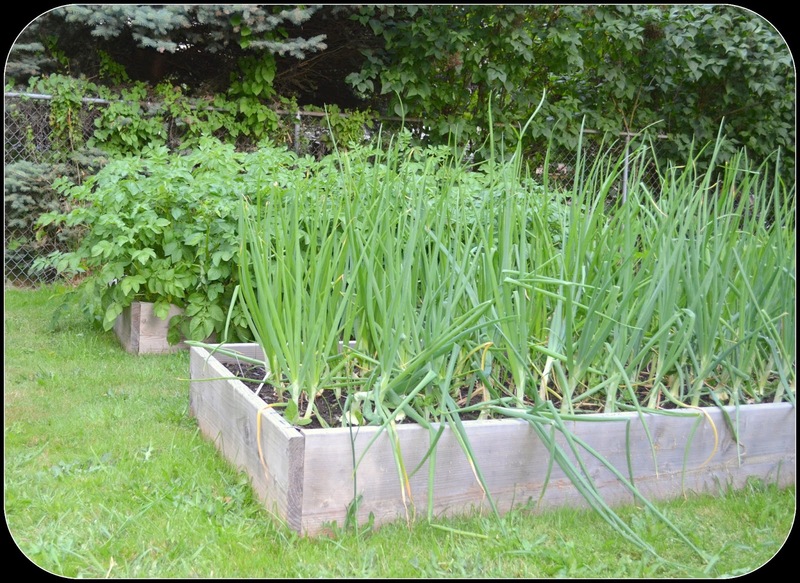 We doubled the size of our vegetable gardens this year by adding an additional 4 raised beds. Our spring vegetables have done so well! I'm up to my eyeballs in snow pea's (why did I plant a whole bed full???) The potatoes are in their final stages of readiness and the onion's Alison sent me...well, see for yourself. I also had a good harvest of spinach earlier and have swiss chard growing as well. Just for fun (and because I had never successfully grown them before) I planted half a box of sweet pea's. I thought it would be fun to have some color. Wow, I had no idea how incredible they smell! 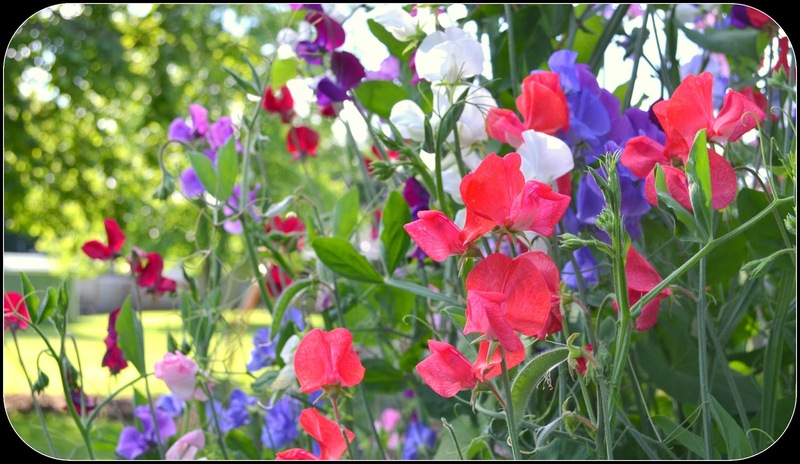 The sweet pea's scent meanders throughout the yard and gardens and is delightful. I will be growing them every year from here on out! In the new boxes, I'm growing heirloom tomatoes, cucumbers, squash, watermelon, peppers, pearl onions, artichoke and sugar pumpkins. My tomatoes and watermelon were started by seed by the awesome Diana. All of the tomatoes are producing fruit. My squash, pumpkin and artichoke come from dear Alison. How lucky have I been this year, with all of these wonderful vegetable gifts by my fellow bloggers? Very luck indeed. What has currently kept me on my toes has been the raspberries. By the looks of it, you'd think, oh, just four rows. Easy to keep up with right? WRONG! I've had neighbors and relatives over to help with the harvesting. We are nearing on picking #4 and that's only the first wave of this ever-bearing heirloom variety. The freezer is filling up! My strawberries are in their first year and while we've gotten a handful here and there, it will be another 2 season's likely before they are robust and mature. My goal is to get in gear and start winter crops soon, rotating them into the spring boxes. 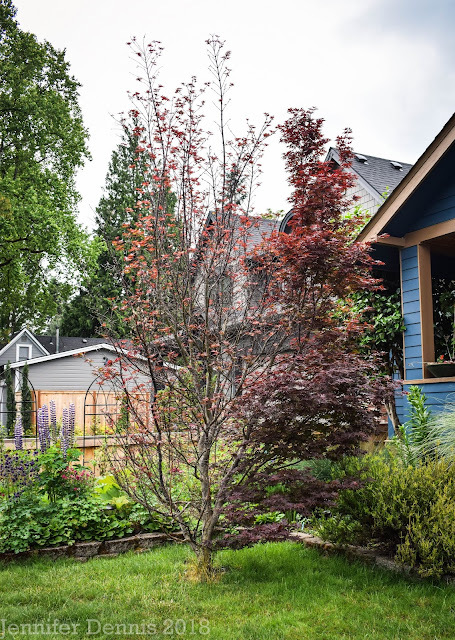 For now, my expanded garden and every evolving perennial bed projects have kept me incredibly busy. But, it's the best kind of busy, the act of production. I'm glad your garden is doing so well! Your onions are getting big. I'm glad you said the strawberries were only giving you a few handfuls since they're new. We've only had one handful from the ten plants I got from you at the exchange, and I was a bit worried that I was doing something wrong. I've been cutting off the runners, which is what you're supposed to do, right? I also think some critter has taken a few. A few that were approaching red have disappeared completely. Birds? ahhhhh, sweet peas!! The best!! It's all looking great. 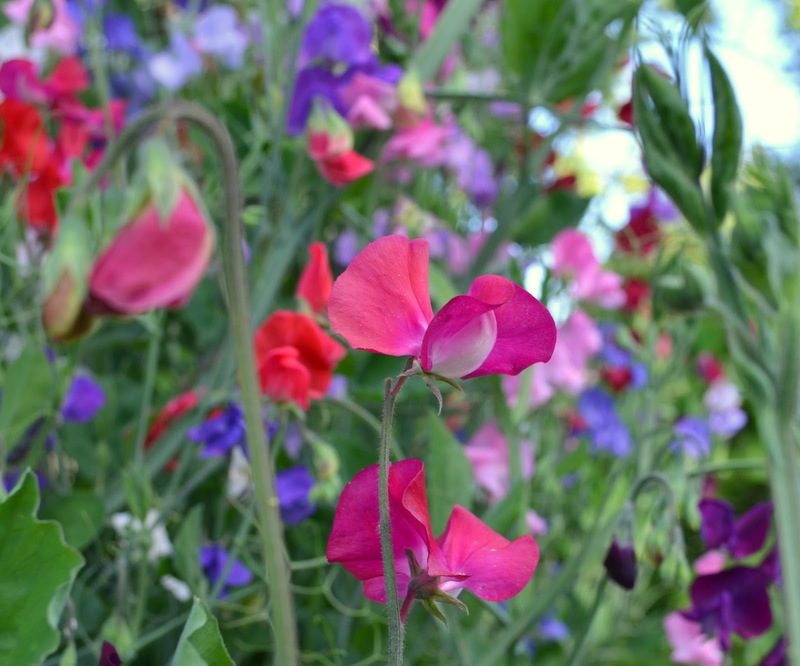 I think the perfume is the best thing about sweet peas. As for raspberries don't mention them - I think ours have died en masse! 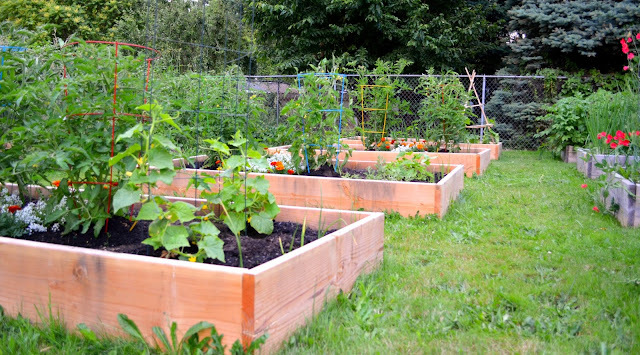 Congrats to you for expanding your garden beds. Everything looks lush and healthy. Those sweet peas are wonderful. Jenni, the garden looks so beautiful, and I'm pleased that the tomatoes are doing so well. I can't remember if we gave you 'Stupice', but ours has finally yielded the first 5 ripe ones. 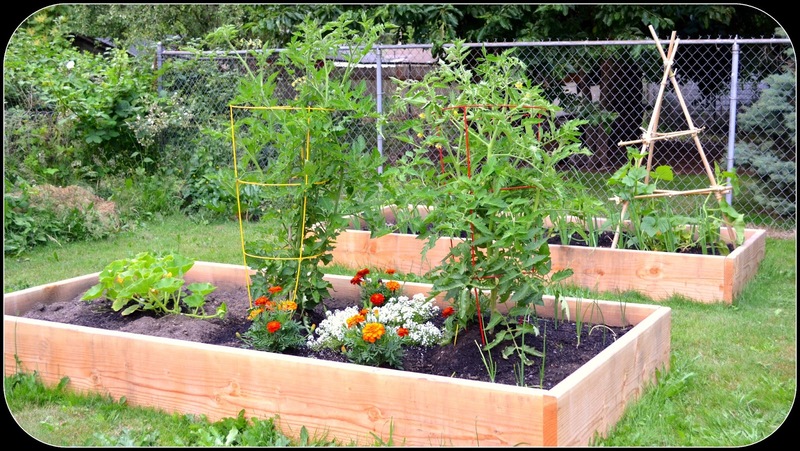 With the sun and heat we're about to have over the next week, we should all see some good growth in the garden. Those sugar snaps freeze well: I just put them in a freezer bag as is; sauteed in a little olive oil and garlic later in the season and what a treat that is. Happy weekend to you and your family! Jenni, it all looks so great. I love the sweet peas. They grew wild in Lead. 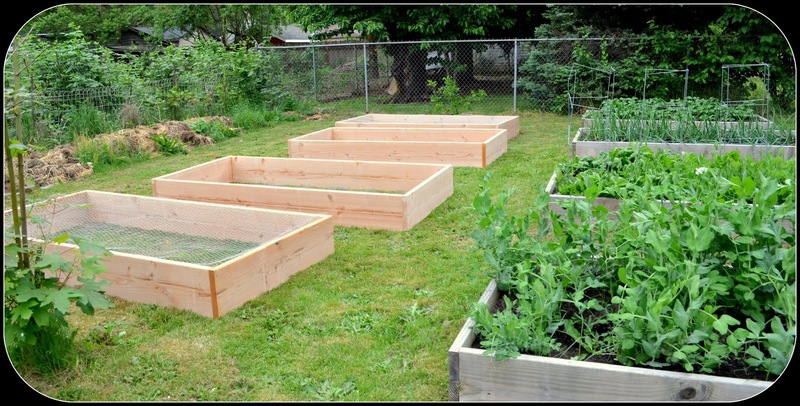 The raised beds look so neat and user friendly. I think of wine when you talk of raspberries. They do make the best wine. You must feel so good having such a large productive garden. Looks like you are ready to feed the masses! Oh wow! How wonderful! BTW-I would happily take your full bed of peas! Ours failed miserably this summer with our crazy heat wave! Your veggie beds are glorious! Can you tell us the name of the raspberries you're growing? I want to plant some in the fall and yours sounds great. Wow Jen! Amazing. Simply amazing.